Trump vs. Powell: How Independent Really Is the Fed? The following article appeared in the February 2019 issue of the European Financial Review. It’s main theme is to show that the Fed, like all central banks, is not independent–of either government or private banking interests pressures–quite contrary to accepted academic economists’ widely held myth. Nor is it true the Fed doesn’t respond to financial markets’ conditions, but only to real economy inflation and employment conditions. Events since last November 2018 clearly reveal that both central bank independence and policy setting apart from financial markets’ performance are just myths. “It was just a few months ago, October 2018, that Federal Reserve Chairman, Jerome Powell, announced the Fed would continue raising its benchmark federal funds interest rate in 2019 and 2020. A next hike was due in December 2018, followed by four more in 2019, and a possible three more in 2020. That would put the fed funds rate at around 4% by the time of the 2020 November national elections. Powell cited, as justification for the 7 to 8 more hikes, a strong US labor market with robust job creation and moderate, though rising, average wages; inflation remaining stable around the Fed’s target 2% annual rate; and indications of a continued growth in the US economy well above a 2.5% annual GDP. Fast forward just a couple months—to January 2019—following Powell’s fall announcement to stay the course on rate hikes. Somehow the entire economic scenario had reversed, justifying Powell to announce a halt in future rate hikes. The keyword Powell offered for the media was that the Fed was now adopting a policy of ‘patience’, as he called it, with regard to future rate hikes. Translated, the reference to ‘patience’ really meant no more rate hikes in the foreseeable future unless US economic data strongly recovered. But had the US economy downshifted that much between October and late December 2018 to assume it was now so weak, in early January 2019, that a halt to all future rate hikes was justified? Had the GDP, jobs, and the US economy dramatically ‘reversed course’ between October 2018 and December 2018, in just a few months, to justify Powell’s abrupt reversal of Fed policy? Not really. US GDP growth rate, QoQ, from late October to late December 2018, had declined only 0.1%, and after December 21, 2018 up until Powell’s announcement in January the US economy was forecast to continue to continue to grow at 2.7%–i.e. a normal post-holiday seasonal softening and comfortably still above the Fed’s 2.5% GDP target. The same lack of data indicating a dramatic shift in employment or wages over the October to January period was also evident. Average hourly earnings rose 0.3% on average each month in the 3rd quarter 2018 (0.9% for the quarter). And it continued to rise at the same 0.3% per month in the 4th quarter. Employment from October through January 2019 grew on average at 241,000 jobs a month. At the same time, the Fed’s target inflation indicator, the PCE, continued to hover around 2-2.2%, suggesting no change in rates necessary in either direction. So if the US real economy hadn’t radically shifted direction after October, i.e. had not fallen off an economic cliff in just two months, what then lay behind Powell’s mid-January 2019 decision to reverse course and abruptly halt 2019-2020 anticipated rate hikes? One possible explanation is that President Trump’s repeated and intensifying criticism of Powell’s rate hikes resulted in the Fed chairman doing an ‘about face’ with regard to Fed interest rate policy that had been in place since 2016. But if Powell shifted policy direction in response to Trump criticism that would mean that the oft repeated claim that the Federal Reserve acts independently of the government is something of a fiction. So was Powell’s shift in response to Trump criticism? Or was it a response to something else? And if something else, what? Central Bank Interference—From Elected Politicians? The idea of the Fed always acts independently is somewhat a myth of conventional wisdom. The notion of central bank independence became generally accepted only around the early 1970s, when monetary policy (and the central bank) arose as the preferred policy choice compared to fiscal policy, which had been viewed as the primary policy choice before that decade. According to the notion, elected government officials were too prone to change policy to ensure their re-election, it was argued. Only appointed, long term, ‘experts’ in monetary theory and practice would not be influenced by personal gain and would decide on behalf of the economy and not their careers. But the idea that central bankers would not be responsive to outside pressure is a fiction. Moreover, the source of outside pressure need not be limited to elected politicians. Since the emergence of the notion of central bank independence there have been several notable cases of political interference to the contrary. And who knows how many cases of private sector pressure on the Fed resulted in Fed policy shift—given the rising frequency of ‘revolving doors’ career changes between appointed Fed governors and Fed district presidents in recent decades. The more obvious cases of political interference have been occurring since the 1970s. President Richard Nixon sacked the standing Fed chairman, McChesny Martin, when he came into office in 1969 and replaced him with his personal friend, Arthur Burns, who proceeded to do Nixon’s bidding by lowering interest rates—despite a massive fiscal stimulus at the time—in order to help ensure Nixon a booming economy in 1972 and his re-election. In 1979 president Jimmy Carter was pressured to replace his standing Fed chairman with a new chair, Paul Volcker. Who were the private and political forces, outside as well as inside government, who forced Volcker on Carter? In 1985, president Reagan, together with his de facto policy vice-president, James Baker, Secretary of the Treasury and later Secretary of State, engineered the removal of Fed chair, Paul Volcker. Volcker had refused to go along with Baker’s demand to shift Fed interest rate policy more aggressively, to drive down interest rates further and more rapidly in order to boost the stock market. Volcker refused and was gone. His replacement, Alan Greenspan, who had done Reagan’s bidding as chair of his Social Security Reform commission, readily agreed to Baker’s demands upon assuming the Fed chair in 1986. That shift in Fed rate policy contributed heavily to accelerating financial speculation that followed Greenspan’s appointment. Excess liquidity from the Fed lowered rates, which in turn played a central role in the subsequent stock market crash of 1987, the concurrent junk bond bubble at the time, and the residential housing bubble and crash that followed both. Another case example was the relationship between president George W. Bush and Fed chairman, Alan Greenspan, during Bush’s first term in office, 2001-2004. As Bush took office in early 2001 the US economy slipped into a moderate recession following the dot.com Tech bust of 200-2001. Though moderate, the 2001 recession showed signs of faltering once again in 2002. The economy appeared to be slipping back into a second contraction after a brief recovery in late 2001 due to a quick infusion of US government spending in the aftermath of 9-11 and accelerated government spending for the invasion of Afghanistan in the fourth quarter of 2001. However, Fed interest rates were already low in 2002 by historical standards. Nevertheless, Bush met with Greenspan and the Fed lowered rates still further after 2002, to an unprecedented 1% fed funds rate. That boosted a housing market that was already long ‘in the tooth’, as they say, and had largely run through a normal cycle that began seven years earlier in 1996-97. The Fed’s further lowering of rates to 1% resulted in the housing market an artificial second wind again in 2003, boosting the US economy out of recession and setting the stage for a robust recovery in 2004 just before Bush’s re-election. Bush thereafter named Greenspan to an extended term as Fed chair. Greenspan continued on the job as chair. Bush got re-elected. But at the cost of the artificially low 1% rates driving the housing market into a bubble starting 2003 for another four years until it bust in 2006-07. Perhaps more of a ‘smoking gun’ case example, the Bush-Greenspan relation suggests the Fed bowed to Bush pressure (i.e. interference) and represents a case of a central bank acting less than independently. Certainly Greenspan must have known that stimulating the housing market so late in its cycle, with so unprecedented low 1% rates, could only have resulted in an inevitable bubble with all its consequences. Were these examples of Presidents—Nixon, Carter, Reagan, G.W. Bush—pressuring Fed policy in order to ensure their re-election chances? In the case of Nixon. perhaps. Certainly not in the case of Carter. By appointing Volcker—who had publicly indicated he would quickly raise rates in the 1980 election year as high as necessary if he were appointed—Carter surely must have known it would seriously jeopardize his re-election prospects that year. The rapid escalation of rates in fact played an important role in the 1980 recession and Carter’s losing the election that year. In the case of Reagan, it appears that stimulating financial asset markets were the primary motive for removing Volcker. There was no re-election on the horizon in 1985. Which raises the question: on behalf of whom and whose interests was James Baker acting by driving out Volcker and replacing him with a more compliant Greenspan? If the motivation was not political re-election, and it was clear the real economy was not in recession and in need of a low interest rate boosting, why then was Baker so determined to have rates lowered? Who would it benefit? In retrospect, the main beneficiaries were the financial markets and investors, especially those associated with junk bond financed mergers and acquisitions and the residential housing-commercial property markets. In the case of Bush, both financial markets and re-election appear the likely motivations for the Fed policy shift. The financial sector in 2003-2007 had a lot to gain from selling securitized assets and related derivatives on subprime mortgages. Their lobbying the Bush administration, and undoubtedly Greenspan as well, was intense at the time. Lower Fed rates played a crucial role in keeping the quantity of new housing contracts rising—upon which the securitization and derivatives financial boom at the time depended. Of course, it may not have been solely financial markets motivated. Bush got his recovery—and thus economic cover to invade Iraq in 2003 and his re-election in 2004 with a strong economy and a war. The point is that presidents don’t interfere with central bank policy only for their own personal political gains. They interfere as well on behalf of other private interests, who may also be ‘interfering’ by lobbying the Fed behind the scenes as well—or lobbying key committee members of Congress and the President to interfere on their behalf as well. It is therefore too simplistic to argue that politicians’ interference in central bank policy is always for personal political reasons, just as it is too simple to assume that private investors and bankers have no access to the Fed and never try to influence Fed policy behind the scenes. This does not mean that private interests do so on the eve of every Fed rate policy decision before its Open Market Committee meets bi-monthly to decide on short term rate changes. The interference typically intensifies when a strategic shift in Fed policy is desired. Reaching back further in US central banking history, the original Federal Reserve created in 1913 was essentially the economic sandbox of private sector bankers. It was structured so the Fed districts and their presidents were primarily staffed by bankers themselves, while the Washington Board of Governors was dominated by representatives of the big New York banks as well. This private banker dominated and run structure prevailed for more than two decades following the founding of the Fed. Only when the Fed screwed up during the great depression of the 1930s, and especially by raising rates in 1932 into a rapidly collapsing US economy—which it did in order to try to protect the financial assets of bankers and investors—did the era of direct banker control of the Fed come to an end. Fed rate hikes in the midst of the depression caused an even worst contraction. Thereafter, central bank reforms were introduced under Roosevelt to bring more direct government appointed governors onto the Fed’s Washington Board of Governors. Other reforms also dampened banker influence at the district Fed. One may argue with evidence, however, that the era of direct banker-investor operation of the Fed ultimately gave way in the course of ensuing decades to a more subtle, indirect banker-investor influence over Fed strategic directions by more indirect means. 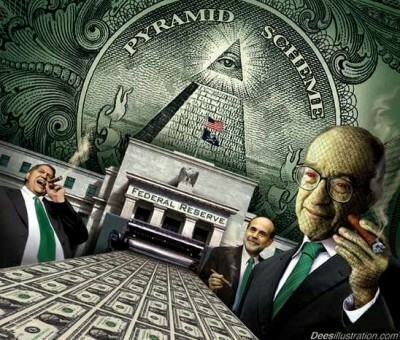 The direct dominance by banking interests over Federal Reserve day to day, tactical decision making during the Fed’s first two decades was generally considered normal and acceptable at the time. There was no notion that the Fed should be ‘independent’ of the bankers themselves. With Roosevelt’s 1935 Fed reforms, for the next two decades at minimum the central bank was relegated to a more passive policy role. The US Treasury Secretary effectively ran monetary policy from the background. It was widely accepted from World War II and immediately beyond that the central bank, having screwed up in the early 1930s, should relinquish its independence to the government—i.e. to the US Treasury. The Fed was relegated to serving as the government’s fiscal agent and to selling bonds to pay for the US debt incurred during depression and war time. Its interest rate policy was ultimately decided by the US Treasury. It wasn’t until the 1950s that the Fed was permitted to slowly reassert a more independent and active role in monetary policy matters. And it was not until the 1960s that monetary policy itself was perceived as an activist economic tool once again. Through the 1950s and 1960s fiscal policy was still king. The Fed gained more policy independence in the 1970s, as fiscal policy failed to stabilize the economy and, in fact, was viewed as having contributed heavily to its destabilization. It was at this time that the notion of central bank independence gained more credence. The collapse of the postwar Bretton Woods international monetary system in 1973, and the dollar-gold standard as means to stabilize currency exchange rates, provided further impetus to monetary policy as primary and thus to a greater role for central banks’ in the ‘managed float’ international monetary system that replaced Bretton Woods. With the even greater reliance on central banking and monetary policy in the post-1980 period in the US, and globally, the notion that central banks were, and should remain, independent grew concurrently. President Trump’s recent attack on Powell and the Fed, building throughout 2018 as the Fed continued its rate hikes, and intensifying at year end 2018, is thus in the long tradition of presidential interference in Fed policy—its strategic direction if not its tactical day to day decision making. But this still leaves open the question of ‘why presidential interference’? Is it because the president wants a robust real economy prior to a re-election? Trump’s attack on Powell and the Fed peaked the week of the Christmas holiday, well after the midterm elections. It’s unlikely therefore that political motivation lay behind Trump’s attacks. Nor could a deteriorating real economy been the motivation. As noted early, nearly all real economic indicators at the time of October-December 2018 show no collapse or even downward trend. On the other hand, financial markets were in freefall after October 2018. US stock markets had collapsed by 30%. Oil was falling by 40%. Emerging markets’ currencies were plummeting, and as a consequence depressing US multinational corporations’ offshore profits repatriation from those economies. For the first time, virtually no high yield corporate bonds were sold. As Trump turned up the heat on Powell in late December, it is likely that representatives of financial interests and investors in the private sector were demanding political action by Trump to halt financial asset deflation—and the massive loss of wealth and values that deflation threatened? Treasury Secretary Mnuchin did not appear panicked for no reason. It was beginning to look a little like late August 2008. As this writer has written elsewhere for some time, financial markets (and the real agents behind them, the wealthy investors and their institutions) have become addicted to low interest rates since 2008. This writer has predicted that the Fed funds rate could not rise above 2.75% without precipitating a major financial markets’ negative response. The Fed has stopped at 2.5% in response to the November-December markets contraction, the worst since 2008 or 1931. Since the Fed halted its rate hikes in January, the same markets have recovered much of their loss—i.e. further evidence of the growing elasticity of stock and other asset prices to Fed interest rate cuts. The financial crash of 2008 was set in motion, at least in part, by the excessive Fed rate hikes in 2008. Well behind the curve of real developments and events, the Bernanke Fed kept raising rates into the slowing real economy and growing financial instability. The Fed funds rate topped off at 5.25% in 2008—i.e. almost twice as high as the peak in 2018 of 2.5%. Fed rate hikes may not have been the fundamental cause of the 2008-09 crash, but can be accurately considered one of the main precipitating causes. In previous recessions and financial crises, in December 2000 and July 1990, respectively, the Fed Funds rate had peaked at 6.5% and 8%. The longer term trend clearly means the US real economy (i.e. real asset investment) is becoming less and less responsive to interest rate change, while the financial side of the economy (i.e. financial asset investment) is becoming increasingly sensitive and responsive to rate changes. The question is why is this so? What’s behind the declining ineffectiveness of interest rates in stimulating the real economy and goods and services prices, while the rate policy is becoming more effective in stimulating the financial economy and financial asset prices? A complete answer to that critical question is not possible here, except to say it has to do with the radical structural changes that have been impacting both financial and labor markets that are being driven by increasingly rapid technological change and the very nature of capitalist economy itself. Presidents act on behalf of financial interests when called upon. And this is probably more true in the case of Trump, himself a long time financial speculator in commercial property markets. It’s not by accident that the press often reports that Trump sees the stock market as the prime indicator of the health of the economy. Trump likely perceived the stock and financial markets steep correction of last November-December as the possible unraveling of the economy in general. He therefore probably intervened in Fed policy without the further factor of at-large financial investors, officers of investment and commercial banks, hedge fund and private equity CEOs, and others lobbying him to do so. But those sources directly lobbying Trump cannot be disregarded either. The relationship between financial sector interests and Trump is undoubtedly quite tight, given Trump’s own origins and his business investments. It has been reported that Trump often calls private business supporters and contributors for advice in critical situations. And they no doubt call him. It is also likely that those same financial interests in late 2018 as markets were imploding were not limiting themselves to just lobbying Trump. Their deep connections with Fed district presidents and their committees (on which they typically hold 3 to 6 of the nine committee seats in each district) almost certainly means they were communicating, interceding, and demanding action by the decision makers within the Fed structure itself. Many former Fed governors and district presidents return to the banking industry after a stint at the Fed. Their personal connections with the Fed enable them to informally and indirectly ‘lobby’ with their Fed colleagues. What these relations between Presidents, the Fed, and financial sector players suggest is that what may appear at one level as presidential or political interference in central bank policy may, at a deeper level, represent private financial interests demanding action by politicians and presidents in particular to ensure the central bank in a crisis shifts its strategic policy direction in order to back-stop and support financial markets. The Fed and Powell may deny that the central bank responds to financial markets, that its mandate is only goods and services price stability and employment, but the reality suggests otherwise. That is especially true of the recent Fed policy shift—where no issues of the real economy demanded Fed policy shift but the financial economy strongly demanded the Fed respond by changing strategic direction. The real economy showed no justification for Powell and the Fed to reverse course with regard to interest rate hikes and policy. But the collapse of US stock markets and other financial asset markets after October 2018 clearly coincides with Trump’s intensifying attacks on the Fed—as well as Powell’s abrupt shift in policy direction in response. It is a myth, and a more contemporary one at that, that central banks always act independently. So too is the corollary, that politicians should not interfere with central banks decision making. Central banks’ strategic decisions are often influenced by elected government officials—and should be. That’s because central bank chairpersons and their committees are not perfectly shielded or uninfluenced by private banking interests. It’s not a question of central bank independence or lack thereof. It’s a question of ‘independence from whom’? It’s a question of central banks functioning on behalf of the public interest—and not in the service of interests of private bankers and finance capitalists or serving politicians acting on their own behalf. But central banks, whether the Fed or others, have never been structured up to now to serve first and foremost the public interest. Central banks were born out of, and emerged and evolved from, the private banking industry, and their first function was to serve as loan aggregator for governments and the political system. They serve those two masters, in a tug of war depending on the crisis at hand. In the latest iteration of that contest between financial interests and government interests, the Fed has clearly responded to the financial sector (despite its denial it never does so) to stop hiking interest rates in order to relieve pressure on the financial asset markets which were beginning to fracture and break due to Fed rate hikes. But the longer term trend appears that central banks, the Fed in particular, can serve both masters increasingly less effectively. Central bank interest rate policy actions are growing increasingly ineffective and destabilizing at the same time. In the case of Europe and Japan, central bank responses to the last crisis in 2008-09 (and subsequent double dip recessions) has rendered their potential for response to the next crisis virtually nil. Rates are near zero or negative. QE appears baked into the monetary structure going forward. Balance sheets cannot be recovered—i.e. QT is dead. Europe and Japan (and Bank of England and Swiss Bank, etc.) have shot off their ammunition and the gun is now jammed and cannot be reloaded. They will resort to ever more risky economic and political alternatives come the next crisis. The US Fed’s is a situation not much better. It has created trillion dollar annual budget deficits for the next decade. The central bank must raise rates to fund an additional $12 trillion in debt coming (on top of the existing $21 trillion today). To do that the Fed must raise interest rates to attract more buyers of its Treasury bonds. But Trump and Powell have stopped raising rates—in response to financial markets’ fragility and inherent instability. And there’s the rub, as they say. The Fed can’t raise rates above 2.75% without precipitating more financial instability. And it must raise rates to finance a $33 trillion US national debt by 2028. Dr. Jack Rasmus is author of the book, ‘Central Bankers at the End of Their Ropes: Monetary Policy and the Coming Depression’, Clarity Press, 2017; ‘Alexander Hamilton and the Origins of the Fed’, Lexington Books, March 2019; and ‘Systemic Fragility in the Global Economy’, Clarity Press, 2016. He teaches economics at St.Marys College in California and blogs at jackrasmus.com.